“On The Buses” is a happy tune with lots of different instruments playing in harmony. The drums are very fast and tricky: there’s some retriggering and variations in the beat used here and there. The melodies are at times a bit confusing and even a little daft. This is actually quite a funny track but I still think the rest of this album is better. “On The Buses (blakeymix)” is more of a serious track. The melody and the sound is nice and warm. Some kind of a choir pad and speech samples on the background and a nice slightly filtered instrument. There’s not much similarities in blakeymix and the original edit except for some samples. “On The Buses (beauty)” takes more ambient side. The track starts with weird samples forming a rhythmic loop with some filtered noises joining in later. The moody melody is played mostly on strings. Later some kind of sine bells join in with the strings – result is a beautiful combination and a very good ambient track. 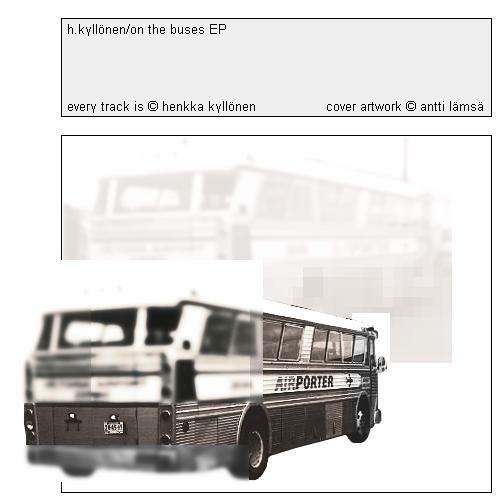 “On The Buses (calm pherm)” is the best ambient track I’ve heard for long time. The melody is very good, even sad, and has a very nice sound in it. This track has very much the same feel as Samuel Barber’s “Adagio”, which is one of my favorite pieces of classical music. The first half of this song is played only with the beautiful strings and pads with some effects. Then the minimal percussions and drumloop give some more edge to the tune without breaking the over all harmony. This one goes to the list of “my favorites of Henkka Kyllönen” for sure. It’s just a shame about those little looping problems.